Cornelia was manufactured by the Bilhorn Brothers Organ Company of Chicago; Peter Bilhorn, an evangelist singer and composer, had developed the fold-out organ as an easy-to-transport instrument for his missionary work with cowboys. George P. Millard, of Peoria, Illinois, purchased the instrument for Mr. Schureman. It was named Cornelia in honor of Mr. Millard’s daughter, who passed away at age 16. The organ also shared the name of Mr. Schureman’s mother. Mr. Schureman began his career as a Sunday school missionary in 1898, working for the presbyteries of Denver and Boulder. Based out of Cheyenne, his territory included seven counties in northern Colorado and all of Wyoming. 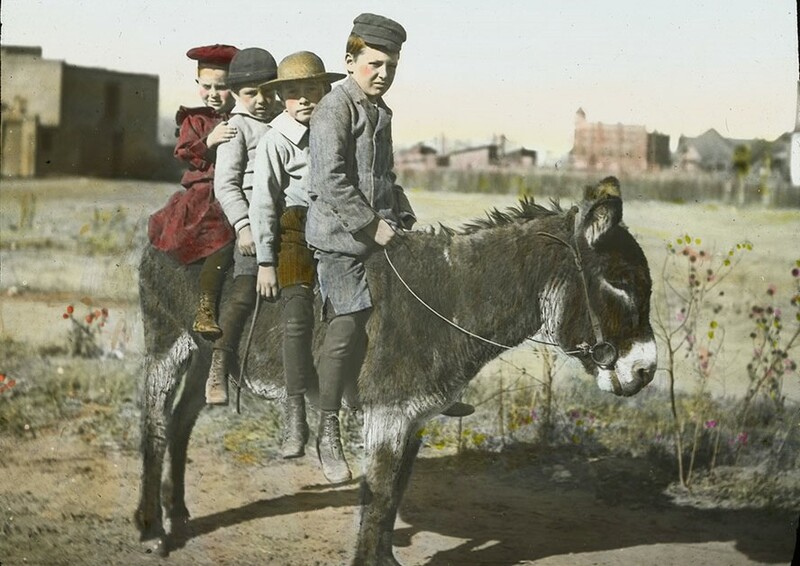 He traveled by horse and buggy, covering 4 miles per hour, Cornelia beside him on the front seat. He traversed the West in that unhurried fashion for 17 years, until he purchased a Ford in 1914. 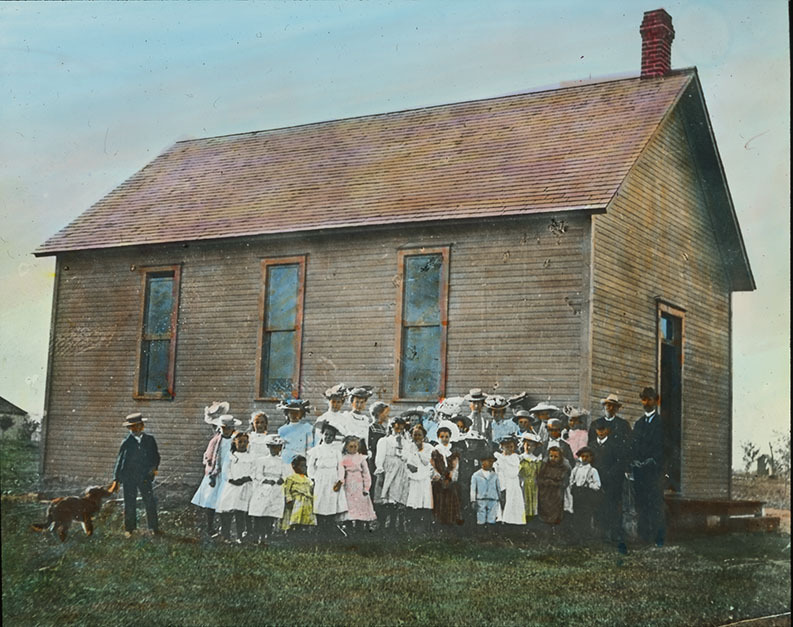 In addition to traveling 300,000 miles, Schureman helped to organize 215 Sunday schools and 35 Presbyterian churches, including the Second Presbyterian Church in Fort Collins, Colorado; he also helped establish 8 rural libraries. Schureman’s tireless work for the Presbyterian Board of Publication and Sabbath School Work even took him across the country. When not traveling the Rockies, he lectured at churches in the East, as well as at three General Assemblies, using colored slides--including ones posted here--to raise money. Pears replied quickly, saying the Society would gladly accept the organ into its holdings. When it arrived in November 1939, reporters from Philadelphia’s Evening Bulletin were on hand to photograph our newest material donation. PHS has been Cornelia’s proud custodian for over 75 years. This fall, after work is completed fully restoring the instrument, musicians will again be able to bring from it a joyful noise. To support the restoration effort, please visit our adopt-a-document page or contact Deana Stuart at 215-928-3865. 14 hours 20 min ago. Today’s #HistoricalFigureFriday honors Reverend James Patriot Wilson. Born in 1769 in Lewes, Delaware Wilson went on to graduate from the University of Pennsylvania in 1788. He initially studied law and was admitted to the Bar but the unexpected death of both his wife and brother led him to a religious path. He was ordained as pastor of the Presbyterian Church in Lewes in 1804 and in 1806 he accepted a call to lead the First Presbyterian Church in Philadelphia. He resigned as a much celebrated pastor in the spring of 1830 before he died December 9th 1830. Our portrait of Reverend Wilson was painted in 1807 by none other than James Peale the younger brother of Charles Willson Peale. This oil on canvas painting represents one of the many large portraits James Peale completed after he shifted away from miniatures. To see more works by James Peale visit PAFA The Pennsylvania Academy of the Fine Arts or the Philadelphia Museum of Art.